FIZIWOO showcased their boastful collection. 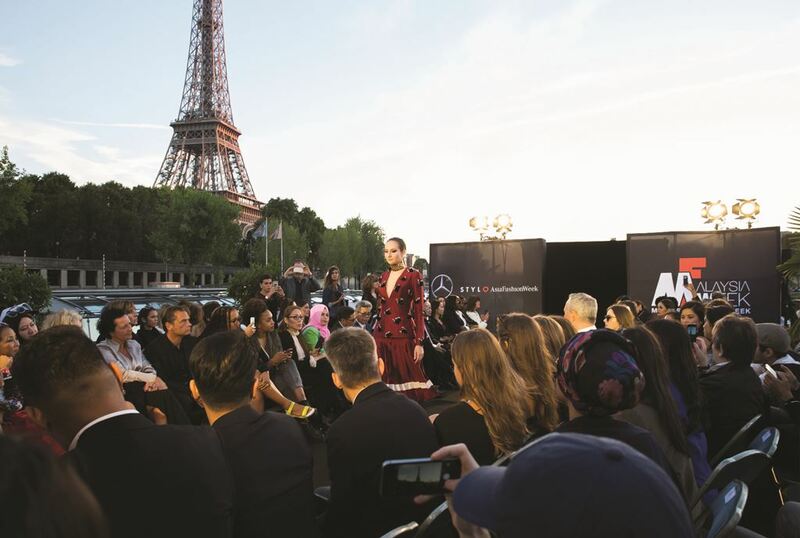 PARIS, 28 September 2016 – Malaysia Fashion Week (MFW) 2016 was officially launched globally today to a host of global guests, trade and media audiences on board the STYLO Asia on the Seine in Paris, France. Organised by Malaysia’s export promotion agency MATRADE (Malaysia External Trade Development Corporation) in partnership with STYLO International (Malaysia’s leading fashion event organiser) and Mercedes-Benz, the global launch of MFW 2016 featured ten top Malaysian fashion designers showcasing their Ready-to-Wear Spring/Summer 2017 collections. The collections were featured through a fashion show held on the boat itself. These ten designers were handpicked to represent Malaysia and serves as an international flag-off and prelude to the MFW 2016 in Kuala Lumpur slated for November 2016. The collections showcased at the global launch embody Malaysian chic traditional wear pulsed with sculptural and sharp-edged silhouettes and whimsical totes. Present at the event were specially-invited guests, among who included French media, fashion influencers and International buyers. As part of the MFW global launch, the Malaysian designers will also be displaying their collections for fashion buyers on the 29 and 30 September 2016 at the Maria Callas Suite at Paris Hilton Opera from 10am to 6pm. This segment will allow International trade buyers to personally meet the ten Malaysian designers and brands, namely Bon Zainal, JO DISAYA, Bill Keith, Keith Kee, Fizi Woo, Tanoti Crafts, Sakura Malaysia, Ruzz Gahara, Porosus and Toi – The Dressmaker, who are all well known for their international appeal, quality and capabilities. MFW, since 2014, has been making headlines and is focused on boosting the Malaysian fashion and lifestyle industry. MFW 2016 in Kuala Lumpur will feature the Spring/Summer 2017 collection of over 60 Malaysian designers at its Malaysia Fashion Showcase segment and over 30 international designers through Mercedes-Benz STYLO Asia Fashion Week. These will be complemented by an exhibition of over 300 booths featuring Malaysian and International fashion apparels, accessories, cosmetics & personal care, arts & handicrafts as well as textiles. Malaysia Fashion Week will be held from 2-5 November 2016 at MATRADE Exhibition &Convention Centre (MECC), Jalan Sultan Haji Ahmad Shah 50480 Kuala Lumpur, Malaysia. PLEASE WATCH THIS SPACE for upcoming Malaysia Fashion Week 2016 updates!